Painting technique characterized by openness of form, in which shapes are defined by loose brushwork in light and dark color areas rather than by outline or contour. Click for more information about the painterly art style. The act or process of using a brush to apply pigment, color or other medium to a surface such as canvas, to make a picture or other artistic composition; also refers to a painted representation or composition. 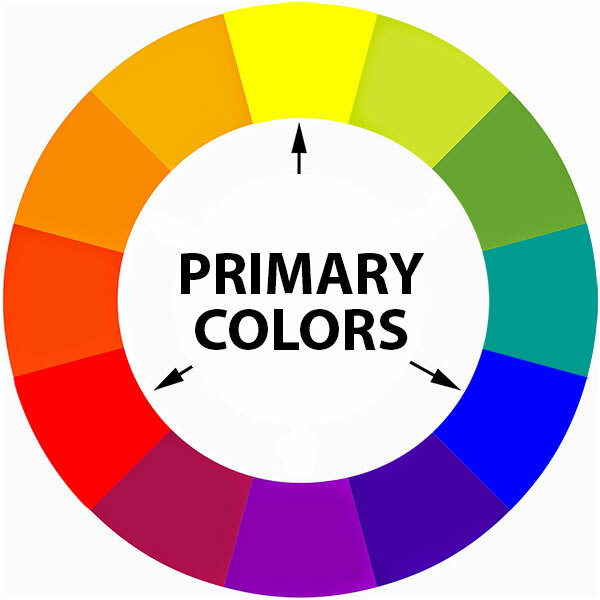 A thin piece of glass, wood or other material, or pad of paper, which is used to hold the paint to be used in painting; also, the range of colors used by a particular painter. Click to learn more about the artist palette. A tool originally used by artists for scraping up and mixing the paint from the palette, this implement has been adopted for the application of heavily impacted paint which is spread thickly like butter (see illustration). 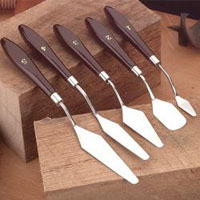 Click link for more information about palette knives. An internationally recognized system of over 3000 pre-mixed colors representing shades on both coated or uncoated stock, along with the precise printing formulas to achieve each color. Each PANTONE color has a specified CMYK equivalent which is numbered and is listed in the swatch guide for quick reference when choosing colors for printing purposes. This system is highly accurate and produces consistent results. The craft of making decorative designs out of thin strips of paper. Also called quilling paper. See “Quilling“. A technique for creating forms by mixing wet paper pulp with glue or paste. The form hardens as it dries, and becomes suitable for painting. Although paper mâché is a French word which literally means “chewed paper”, it was originated by the Chinese – the inventors of paper. The predecessor of modern paper made from the pith of the papyrus plant used by the ancient Egyptians, Greeks and Romans. An early paper material highly valued during the middle ages. Originally made from goat or sheep skin, parchment today is made from organic fibers and affords artists such as calligraphers a crisp, smooth, high quality surface on which to write. A crayon made from pigment mixed with gum and water and pressed into a stick-shaped form; a work of art created from pastels; a pale color.  Refers to any pigment which is expected to last or remain without essential change and is not likely to deteriorate under certain atmospheric conditions, in normal light or in proximity to other colors. The art of picturing objects on a flat surface so as to give the appearance of distance or depth. 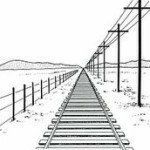 Click for information on perspective drawing. 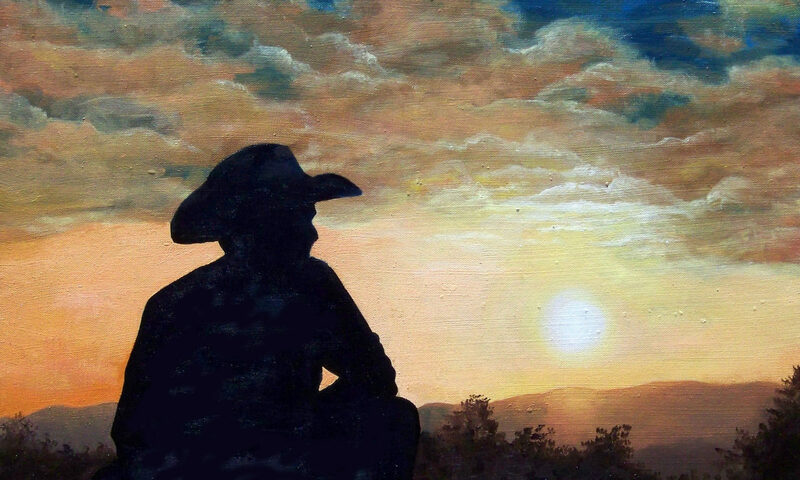 A style of painting in which an image is created in such exact detail that it looks like a photograph; uses everyday subject matter, and often is larger than life. Click for more information about photorealism art. A professional image-editing and graphics creation software from Adobe. It provides a large library of effects, filters and layers. 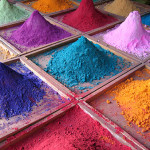 Any coloring agent, made from natural or synthetic substances, used in paints or drawing materials; the substance in paint or anything that absorbs light, producing (reflecting) the same color as the pigment. A shape which is essentially two-dimensional in nature but who’s relationship with other shapes may give an illusion of the third dimension. French for “open air”, referring to landscapes painted out of doors with the intention of catching the impression of the open air. Plein air is when an artist goes out on location to paint. The position from which something is seen or considered; for instance, head-on, from overhead, from ground level, etc. A painting technique in which pure dots of color are dabbed onto the canvas surface. The viewer’s eye, when at a distance, is then expected to see these dots merge as cohesive areas of different colors and color ranges. A style of art which seeks its inspiration from commercial art and items of mass culture (such as comic strips, popular foods and brand name packaging). 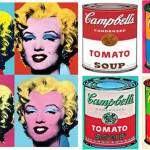 Certain works of art created by Andy Warhol and Roy Lichtenstein are examples of pop art. Click for more information about pop art. A painting, photograph, or other artistic representation of a person. Space that is occupied by an element or a form. A craftsman who shapes pottery on a potter’s wheel and bakes them it a kiln. A horizontal disk revolving on a spindle and carrying the clay being shaped by the potter. A form of ceramic technology, where wet clays are shaped and dried, then fired to harden them and make them waterproof. Red, yellow, and blue. With these three colors (and black and white) all other colors can be made. 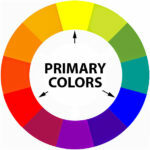 The primary colors themselves can not be made by mixing other colors (see illustration). Art that has imagery of folk art, it places emphasis on form and expression and often looks child like. The basic aesthetic considerations that guide organization of a work of art. They include balance, movement, emphasis, contrast, proportion, space and unity. See the discussion on Good Design Principles in this website for more information. The process by which a work of art can be recreated in great quantity from a single image usually prepared from a plate. A sense of appropriateness in the size relationship of different parts of a work. For more information about proportion, see the article Principles of Good Design: Proportion. Art in any media that has been planned and executed with the intention of being staged in the physical public domain, usually outside and accessible to all. An equilibrium created by identical parts that are equally distributed on either side of a real or imaginary central axis in mirror-like repetition.